AMETEK PDS Standby Engine Indicators interface either directly to the engine sensors or through the FADEC to provide the necessary redundancy needed for modern glass cockpits. 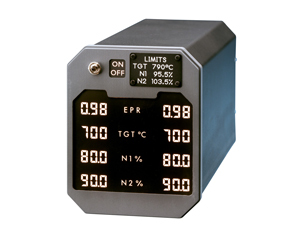 The standby engine instrument unit consists of a data acquisition system, which conditions the input signals received and displays 4 engine parameters: EPR, TGT, N1 and N2 for each engine. The loss of signal for any of the inputs can be detected and displayed. In addition, the unit uses low power and meets certification requirements for engine indicating functions in loss of electrical power situations. Contact us today to learn more or for a full demo!